Take a little bit of The Normal Heart and add a dash of Longtime Companion and you get the strikingly powerful BMP, the winner of Cesar Best Picture and the Cannes Grand Prix. BPM starts out as a documentary style drama chronicling the early 90s French branch of Act Up and like The Normal Heart, it quite effectively details the struggle within struggles to find a cohesive approach, message, comradarie. But as the film goes on it becomes a personal love story between two men, one sick and dying and another trying to hold on to what they have, very reminiscent of Longtime Companion. BMP does both well and transitions seamlessly between them. BPM's strength early on is the way it captures that conflict often present in many grassroots movements between its members' varying degrees of passion as well as differing ideals and divergent strategies. Anyone involved in social justice movements will recognize these struggles and relate to them. 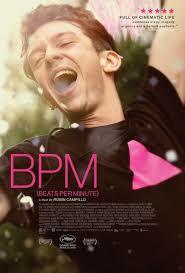 BPM is powerfully accurate in this regard while not trivializing the issues or making it feel melodramatic. The demonstrations of Act Up are powerful in their approach and dramatized here one can't help but get caught up in the adrenaline as well as the fear. BPM shows us the risks these folks are taking and the way people respond to putting themselves on the line like that. But the film becomes even more engrossing as it focuses on the love story between characters played by Nahuel Perez Biscayart and Arnaud Valois. They're finding each other is portrayed not in the filmatic tradition of making it something miraculous. Instead the film allows them to just naturally come together and gradually intertwine their lives into something beautiful in the face of disease and death. This very realistic approach by film maker Robin Campillo, a member of Act Up himself in the 90s, makes it all the more powerful. It feels lived in. Honest. What BMP doesn't feel is safe. Some films dealing with these volatile issues from a long time ago, have that security of distance in how they are speaking to something from the past. BPM feels vibrantly relevant and speaks to a group of heroes who responded in their moment in their time an are perhaps calling us to live into that today. I love movies and discussing movies more than anything and this is one forum for me to share my love.